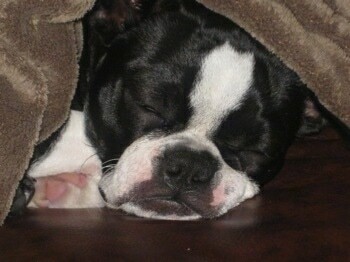 The Boston Terrier is gentle, alert, very intelligent, well-mannered and enthusiastic. Without the proper amount of mental and physical exercise it can become rambunctious and a bit high strung. They are very sensitive to the tone of one's voice. Boston's like to learn and therefore are not difficult to train. Their intelligence ensures they pick things up quickly. If the humans around the dog do not display the leadership that all dogs need, they will become willful as they begin to believe they are running the show and need to tell YOU what to do. Do not allow the Boston Terrier to develop Small Dog Syndrome, human induced behaviors where the dog believes he is pack leader to humans. This can cause a varying degree of behavior issues. 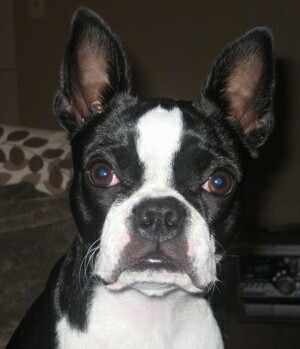 Bostons need a gentle, but firm, confident, consistent pack leader who knows how to display authority over the dog. It is canine instinct to have a strong leader and this little guy is no exception to the rule. Either the human will be that leader, or the dog will. 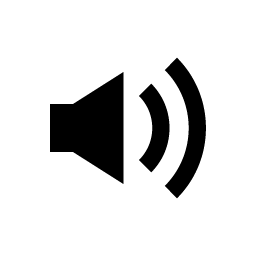 Some owners have reported that their dogs are good watchdogs, barking only when necessary, while other owners have reported their female Boston Terriers do not bark at the door at all. 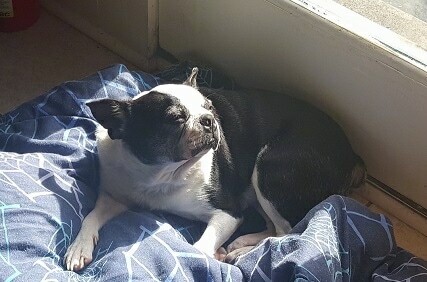 Most reliable with children, especially good with elderly people and very friendly with strangers, the Boston Terrier is playful, very affectionate and likes to be part of the family. Very popular in the United States, due above all to its excellent character, they generally get along well with non-canine pets. Without proper leadership from humans communicating to the dog what is acceptable behavior and what is not, they can become dominant and may fight with other dogs. These little dogs may be difficult to housebreak. Bred down in size from pit-fighting dogs of the bull and terrier types, the Boston Terrier originally weighed up to 44 pounds (20 kg) (Olde Boston Bulldogge). It is difficult to believe that these stylish, little dogs were once tough pit-fighters. In fact, their weight classifications were once divided as lightweight, middle and heavyweight. 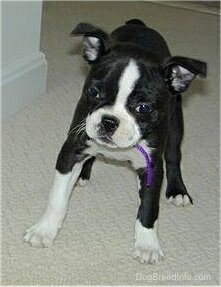 Originating in the city of Boston, Massachusetts, the Boston Terrier is one of the few breeds developed in the USA. 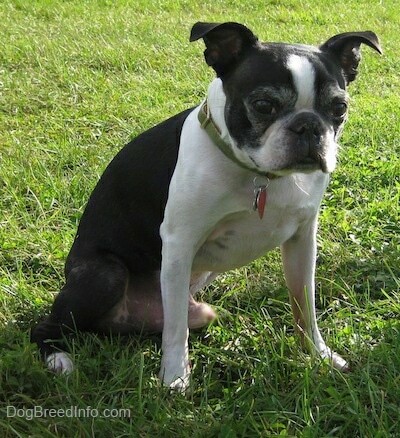 The original Boston Terriers were a cross between the English Bulldog and the now extinct English White Terrier. Around 1865, the coachmen employed by the wealthy people of Boston began to interbreed some of the dogs owned by their employers. One of these crosses, between an English White Terrier and an English Bulldog, resulted in a dog named Hooper's Judge. Judge weighed over 30 pounds (13.5 kg). He was bred down in size with a smaller female and one of those male pups was bred to yet a smaller female. 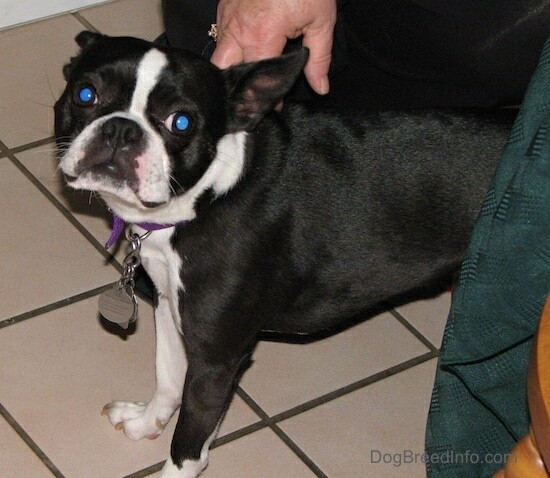 Their offspring interbred with one or more French Bulldogs, providing the foundation for the Boston Terrier. By 1889 the breed had become sufficiently popular in Boston that fanciers formed the American Bull Terrier Club, but this proposed name was not well liked by Bull Terrier lovers. Nor did they like the breed’s nickname, "roundheads." 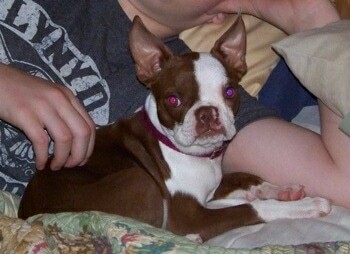 Shortly after, the breed was named the Boston Terrier after its birthplace. The breed was recognized by the AKC in 1893. It was first shown in Boston in 1870. In the early years the color and markings were not very important but by the 1900s the breed’s distinctive markings and color were written into the standard. 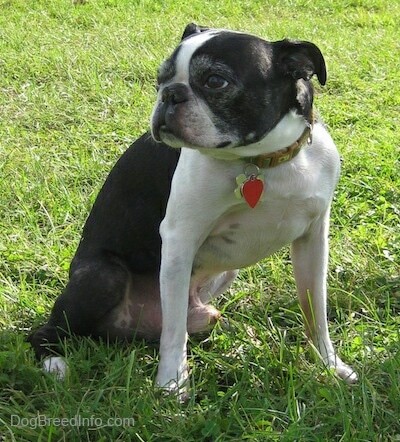 Terrier only in name, the Boston Terrier has mellowed from the pit fighting dogs of the past. 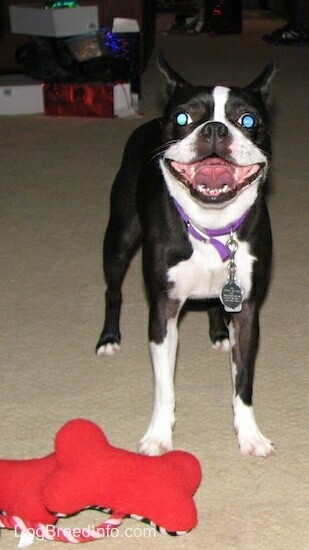 Kali the Boston Terrier at 5 years old—"I had decided not to ever own a dog again when Kali came along. Her previous owner had to move out of state suddenly and Kali needed a home. I decided I'd only keep her until I could find her a new home. That was two years ago. She found a new home right there with me. 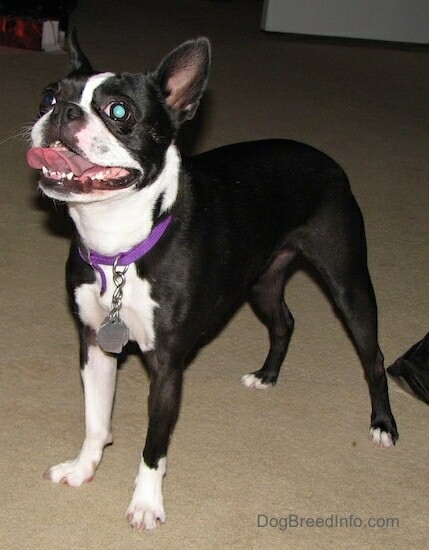 She is not a typical Boston Terrier. She is quiet and loves to sleep. She will play for a while but then she gets tired and goes to her bed. She knows a few tricks. Her favorite is climbing onto my bar height table to steal food. It's not a trick I'm fond of." "Sheeba is the joy of my life! She is very active, loves joining for walks (especially at the beach where she can run and play in the sand), loves playing with her toys, but most of all she loves to cuddle. I make sure to keep her active, nutritious and very loved." "I love watching Cesar Millan's show as it helps me understand certain behavours to look for and how to correct them to make sure Sheeba and me are both happy! Learning the right communications with your dog is a way to have the best friendship." 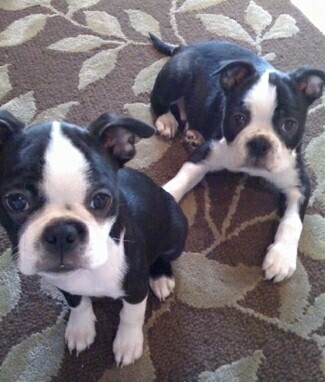 "These are my Boston Terrier puppies, siblings Oliver and Clementine (sister on left, brother right back) at 10 weeks old. They are in our house on the living room rug. 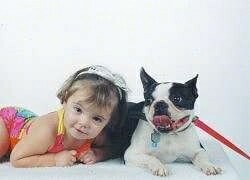 Since Boston Terriers are such great family dogs, we have hopes to use them as therapy dogs. Our 3-year-old Lab with excellent manners has used her authority and gentle manner to do most of the training for the puppies—they really model her good behavior. They have not learned to jump on the furniture and to come when called—they go where our Lab goes. We try to maintain balanced, calm household energy because we've noticed how unbalanced, anxious energy affects ours and others dogs. We are enthusiastic believers in Cesar Millan's techniques, and we do our best to keep a happy home with limits for our dogs! 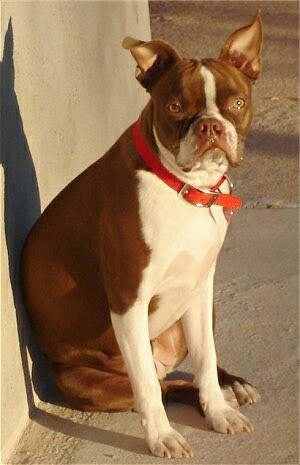 Thanks dogbreedinfo.com for sharing so many photos and characteristics of all purebreds and mixed breeds!" 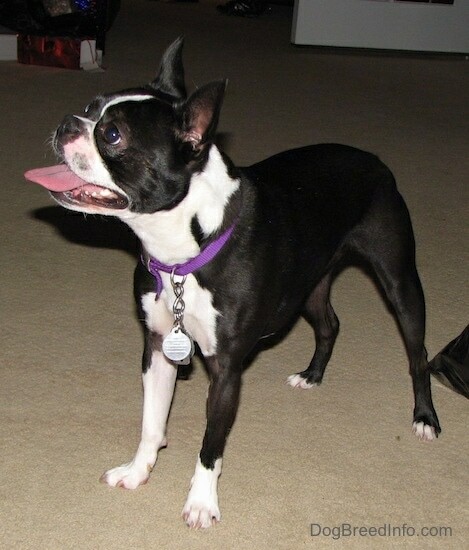 Oscar the Boston Terrier at 2 years old—his owner says, "He is a very, very active Boston. He loves his toys and playing with Belle, his French Bulldog playmate." 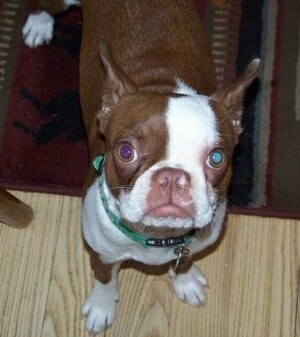 Zigzag the Boston Terrier at 2 years old—her owner says, "She is such a smart dog. She knows about 30 different tricks, like dancing and riding a skateboard." This is Chelsea and her best friend Buddy.